With a lot of perseverance and a little help from her mama, Annika finished her skirt. 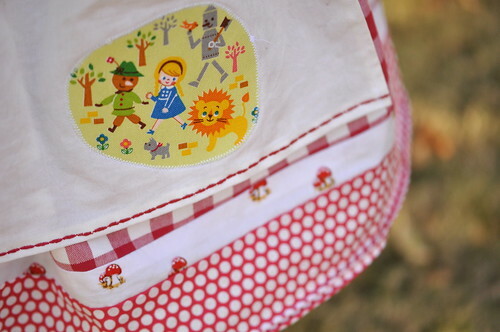 She added this sweet applique from some fabric that Melissa gave us this summer. Those little details are so important, don't you think? The pattern is the Evelyn Apron Skirt by Jona Giammalva, and I would highly recommend it. Jona's innstructions are very clear and she has clever construction methods that really work - you can tell she knows her way around clothing construction. We have all of her patterns and I love them. Jona is local to us and is a friend, but my love for her work has nothing to do with our friendship. I'm just lucky to have talented friends. The gingham fabric is from Ikea and frays a ton, so if you use it, be forewarned. I love what Ikea is doing with prints right now, but it requires very finished seams. The mushroom is Heather Ross, of course. I'm using what I have sparingly. The dots are Moda, if I remember correctly. She's ready to start a new project, so that means this one was a success. Next up - an art bag for her watercolor supplies. We have some outdoor painting to do. It's winter in Arizona after all. Sweet! Annika, I'd love a skirt in my size....any chance?? You're my go-to seamstress now. Congratulations on a wonderful project beautifully completed. What a wonderful first project! So cute! OH MY GOSH!! I'm running for the tissues because I need to dab my eyes! Annika just took this pattern over the top and I'm so happy! This is the first thing going on my new Pinterest fabric board. Thanks for being extra creative with this skirt (I knew you would!). It warms my heart. Tell Annika she did a beautiful job with it! hip hip! nice work annika! I love it! The skirt turned out so, so nice! Great job. so cute! i want to steal it! badly! don't say i didn't warn annika! Id say its true to size and is fairly flexible since its an elastic waist. Im going to make one for Kit too and just size the 2 down a bit for her. She should get a lot of wear out of it. I think the 9/10 would definitely fit your girls - thats what I used for Annika and I didnt adjust it. even if my kids are a 12/14 in gap or the like? could i add a bit of width and length easily? Love all those wonderful red and white prints together! Enjoy it and wear it with pride - and tell Everyone you made it! My girl is only six but we are already looking forward to lots of sewing time together too. Oh, you must be so proud! I love especially how good it looks with those awesome boots! 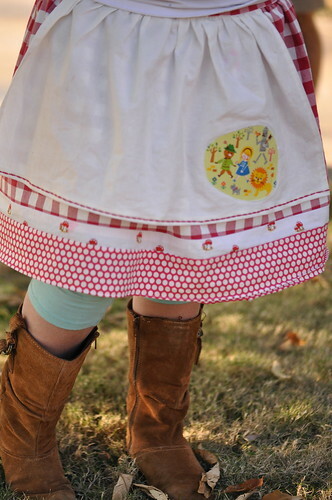 This is just the sweetest skirt ever!